Size: 8.1" x 5.6" x 1.5"
The TI-5027 is one of the early battery operated desktop printers sold by Texas Instruments. Dismantling the calculator reveals its true genes, actually it was developed and manufactured by Toshiba in Japan. Please notice the Toshiba brand etched into the printed circuit board (PCB) of the calculator. 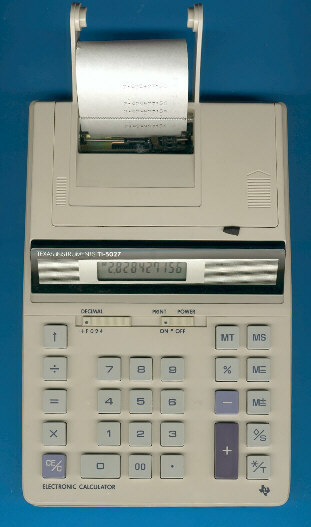 The TI-5027 was soon replaced with the similiar TI-5027 II sporting a larger display.